When you are a budding tattoo artist it can become a little overwhelming trying to figure out all the supplies you need just to start practicing. That’s where tattoo kits come in. ​The best tattoo kits for beginners will give you everything you need to practice, and a bunch of educational material to help you build a foundation to develop your skills as a tattoo artist on. 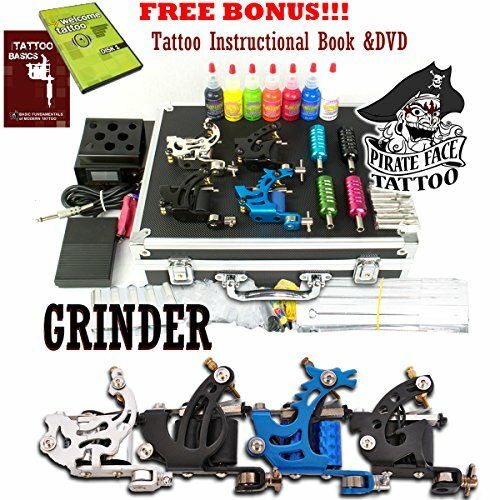 First off, the best tattoo starter kit is the Grinder Tattoo Kit by Pirate Face Tattoo. Below are full reviews of a few tattoo kits and why they might work for you. 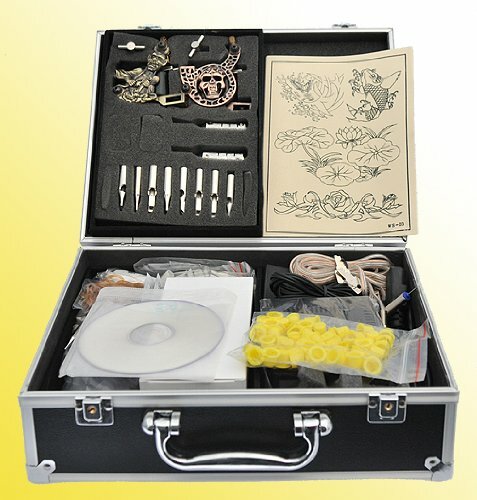 What Makes This a Great Tattoo Kit For Beginners? 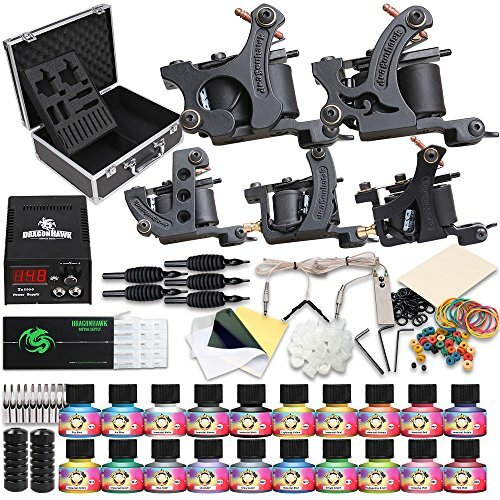 This kit is a great starting off point because you are given four machines that you can use to practice and master how to tune a tattoo machine with. Also, they are really good machines that are lightweight and easy to learn on. They hit pretty hard out of the box so keep that in mind when tuning. These machines are easy to work on, meaning as you gain experience you can upgrade parts to improve them with ease. Also, you get The Basic Fundamentals of Modern Tattoo included in the kit which is priceless to the newbie tattoo artist. The kit has recently been upgraded to include Radiant Ink, which is a really good quality tattoo ink to start practicing with. Also, we love a beginner tattoo kit with practice skins. This Kit comes with a lot of really good stuff, but the needles should only be used for practicing with. They tend to come pretty dull, but that is a good practice with any kit you choose. And the tattoo power supply, while fully serviceable, is something that is better served as a backup power supply and should be upgraded before you move on from practicing tattoo to the real deal. The transfer paper and practice skin is not ​that great, and the instructional DVD won’t teach you much at all. Overall this kit is great. The machines, the book, and the inks make the kit pay for itself. It comes with everything you need to start practicing tattoos right out of the box, also, it comes with a carrying case that comes in handy when you’re on the go. We recommend this tattoo machine kit for any beginner that wants to start off mastering coil tattoo machines. JRFoto offers one of the best experience when it comes to tattooing for novices. The latest kit they are offering contains eight coil machines of varying designs, 10 wrap coils, disposable and non-disposable tips and needs, seven ink bottles, grips, and a power supply that functions in 110 and 220 volts. 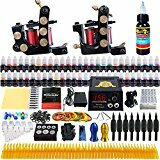 What Makes It a Great Tattoo Kit for Beginners? Premium Tattoo Kit is more than just a name. You get quality in just about everything you see in this kit. Among the six machines, one of them is made out of brass, and the others are your standard stainless steel machines. The tips and grips are crafted from stainless steel so you can expect them to last. However, we always recommend you don't use metal tips or grips. It's too much of a health risk. Instead, opt for disposables and use these only when practicing on fruit or practice skins. Speaking of practice skins. The JRFoto comes with a decent one, so all you have to do is set up your workspace and begin training. Practice skins are handy, and the only thing you should tattoo while you're learning the basics. The learning material is this kit is a big bonus. A lot of us prefer to learn visually, so the DVD they provide is a good tool. We still recommend you look for more resources to learn how to tattoo, but this DVD is a good start. You may notice that the power supply ​doesn't provide a good amount of power. It's best that you only use it for training. Since it may not be robust enough to handle actual work. In general, this remains as a good tattoo kit for beginners that can help you nail down your hand movements and grip so can impress your clients down the road! This tattoo kit is suitable for the most creative artists out there who wish to practice using a broad range of colors. This kit has 54 inks along with two coil machines, a power supply, and a collection of grips, needles, tips, grommets, and just about everything else you need. This kit contains a LOT of tattoo inks. If you're an artist who is really into abstract colors or what to learn how to create varying shades, then this beginner tattoo kit is perfect for you. This kit comes with a blank practice skin that you can start to practice with right away. What's good about the faux skin is that both sides can get tattooed on, which gives you, even more, skin to practice on. Sanitation is important. And it's something Solong Tattoo gets right. You can tell because everything is disposable and packed individually so as to ensure that bacteria get through. The colors are a lot lighter than you'd expect, especially the black ink. If you want to do any real shading, you'll want to upgrade to some better inks. And the inks are real high-quality. They are great for practice, though. Also, the instructional material is non-existent. Sure, they give you a little manual on how to set everything up, but to be a good tattoo artist you need a lot more than that! Tattoo Like The Pros can really help you fill in the gap. Read our guides on how to use your equipment, set it up, and of course how to tattoo. The Solong Tattoo Kit is one of the best beginner tattoo kits to buy it you want to experiment with colors. You'll be able to learn how to create many unique shades of colors thanks to the crazy amount of ink they give you. Which is a skill every great tattoo artist should know. If you are looking for a tattoo kit that has all the right tools you will ever need when enhancing your artistic skills, be sure to pay attention to Dragonhawk Complete Tattoo Kit. The supplies you will obtain from this include a total of five coil machines, a power supply, 20 pigments, sets of grips, needles, and tips, and even an instructional CD. The best part of the product is diverse kinds of tattooing equipment. As a beginner, you may have only recently held such a machine in your hands. And since each of them within the kit has a distinct design, you will get a chance to sample various machines and figure out which one you are comfortable with. The colors you can practice with are just the right amount as well and all made in the USA. Not too many nor too less. This is important because it entails that you do not have to spend more while you are still training. Thus, you get to save your money for when you need to buy a professional machine. There are a lot of needles, tips, and grips that you get to sample too. The fact that you have these on your table means that you will learn which type works better for a particular design. In this manner, you can assure your future clients that you know what you are doing. Any drawing that you think of recreating can be completed on the practice skin added in the tattoo kit. This item is essential because you cannot test your tattooing competency on a living thing, and yet it feels and seems like the skin of a human being. Also, the power cord attached to the box offers practically. It may look flimsy from the outside, but it can give the most expensive wires a run for their money. Although the power supply has efficient rotary and LCD display, it has been encased in a plastic material that can easily break in case you accidentally knock it off the table. Its temperature also goes up quickly; that’s why your practices may be halted several times in between. It will be hard to search for a tattoo kit that is as affordable and as effective as the one created by Dragonhawk. This is the best rotary machine kit for beginners. In it comes everything you will need to start practicing your tattoos! The educational value in this kit is literally as good as it gets. 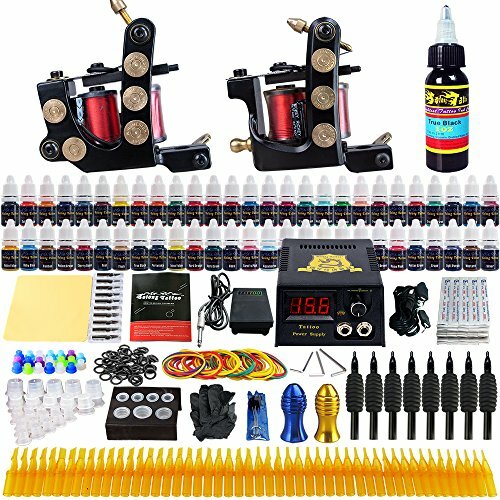 You are also provided with two excellent tattoo machines and great inks that will have you well on your way to becoming a master tattoo artist. You not only gain access to teachmetotattoo.com which features tons of video tutorials, guides, and access to forums where you can talk to, and learn from, other artists, but you also get two other great reference tools: The Basic Fundamentals of Modern Tattoo, as well as a training DVD. If you are struggling to find an apprenticeship then these education materials will help you get a head start while you wait. Most kits you buy are filled with, let’s be honest, less than quality materials. This rotary tattoo machine kit is different in that respect; there’s actually some great stuff in here! First off the machines, in this kit you get two high quality rotary tattoo machines: The Hildbrandt Beretta and the Hildbrandt Silencer. Both of these are a little different than your run of the mill rotary tattoo machines, they both have an armature bar driven design—which is a concept taken from your traditional coil tattoo machine set up. This design really helps with the overall efficiency of the machine. Also, since they are rotary machines they are both quiet and lightweight. The power supply and Ink are also really great. The ink is made by Radiant, which is loved by a lot of tattoo artists. The ink colors stay true and are easy to work with. Plus the Hildbrandt VIP Membership Card gets you 7% at hildbrandt for life! How great is that? There are some downsides to this kit like there are to any kit, and that’s that some of the products are just not up to grade. For instance, you should probably upgrade to better tubes, and the transfer paper isn’t all that great. One thing you should do with almost any kit is, only use the needles for practicing on things other than human skin, i.e. fruit or practice skin. They just aren’t sharp enough to tattoo on the skin, well you can do it, but it will be at the price of your client's happiness and comfort! By and large, this is the best rotary tattoo kit you can buy. 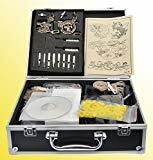 It’s great for beginners and intermediate tattoo artist, even pros can utilize a lot of what this rotary kit has to offer. You’re going to get top of the line educational material, great machines, good power supply, and ink, as well as tons of other good miscellaneous things you need to tattoo. You will need to buy better needles and tubes, but that is true with almost any tattoo machine kit out there. Once your tattoo kit arrives you generally want to dive right in, but you should take the time to learn the basics of tattooing, the health risks, and proper sanitary practices, and then practice before you ever try and tattoo anybody's skin—even your own. And you should seek out an apprenticeship if it is feasible for you to do so. Also, don’t ever use the needles you get in a tattoo kit on a person's body. More than likely they are going to be dull needles, and can do some real damage to the person's skin. The ink that usually comes with kits is substandard as well, and you should do a thorough check on the brand before ever using it on skin. Both the kits above come with Radiant Ink which is a sterilized ink made in the USA, most kits come with ink from China that is not made with sterilization in mind. If you do get ink that is not safe, only use it on fake skins and fruit to practice with. The reasons why the Grinder Coil Tattoo Kit is the best tattoo kit for beginners is simple: They both come with high-quality machines, high-quality ink, and excellent training resources. You can’t go wrong with either one, it just comes down to whether you want to learn how to tattoo using rotary tattoo machines or coil tattoo machines.